And with that, Volume 5 of Twice the Triplets comes to a close. For those of you who have discovered the comic in the last year or so and weren’t around for this before; this does not mean the comic is ending – just that there will be a bit of a break between now and when the next volume begins. Normally these breaks fall in the summer time, but with the numerous delays early on with this volume, things have had to be pushed back a bit. I plan to make the break relatively short this time, and get back to you all with new comics soon! In the meantime, I will be posting updates and maybe some bonus stuff in the site news section below, so it may just be worth your while to keep checking back. Keeping an eye on my twitter may be a good idea if you want to make sure you’re not missing the latest news. Some of you may have noticed that this update came on a Saturday, rather than on Sunday. There’s a reason for that. I felt it more fitting to post an update on September 22nd, which just so happens to be today. What’s the significance of that, you ask? 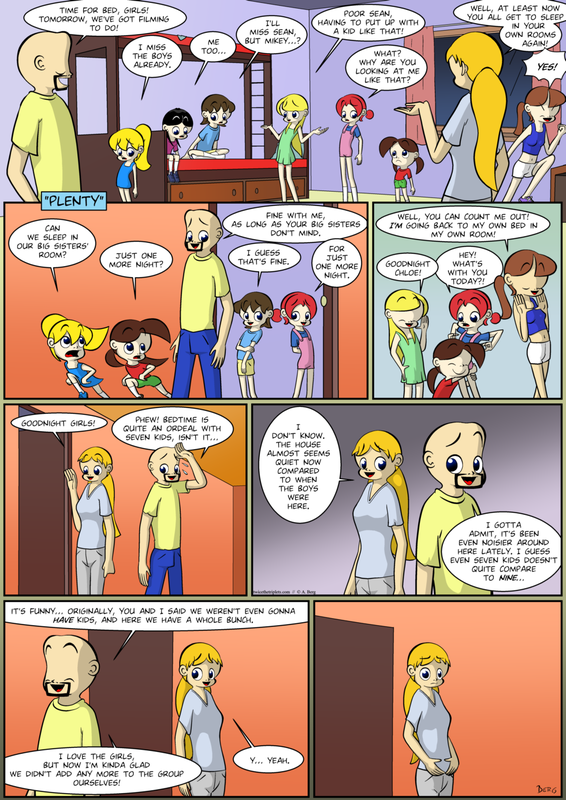 Well – it was on September 22nd, 2013 that this website, as well as the first page of the comic went online. Five years ago. It’s Twice the Triplets‘ five year anniversary! Today!! It may be a cliché to say this, but I hope you’ve all enjoyed reading the comic these past five years as much as I have enjoyed working on it. I want to thank all of you who take the time out of your day to read it every week, and especially those who enjoy it enough to leave comments and discuss it, here or elsewhere, in the form of observations, speculations, praise and critique – it’s all appreciated (the rare troll comment notwithstanding). Knowing there’s an audience that cares helps keeping me motivated to keep this whole thing going. Even when you mean well, you just can’t quite keep your foot out of there, can you, Fred? I don’t know how old Fred and Dacey are, but even if they’re in their mid-to-late-30’s they’ll still be young enough to safely have at least one kid when the Big Three grow up and move out. WELP! Looks like we’re going from 7 ot right folks. Any bets on a boy or a girl? Intriguing… Please, do go on. Can’t wait to see how the girls handle all this. Nice thing about a family this size, one more doesn’t make a huge dent. I’m sure Dacey’s sister (it’s been a while, I forgot her name!) can pitch in on some of the work. Welp who’s betting on 3×3? That’s not the question. The question is if the set will be all girls or all boys… I’m betting on more girls. Oh dear. Thrice the Triplets? Kiley must have had an eliohany after brushing with Mikey, because now she’s acting nicer to Summer. Yep. Any bets on how long that will last? Soooooo… If Dacey has twins, would she be an Octomom? Hm. Not sure. I’m not really up to date on the Octomom requirements. Dacey should have brought this subject up earlier–perhaps she hadn’t thought of it until now. You think 9 is bad? OH BOY, it’s gonna be fun with 10!